It's dark, slippery and wet but still, no trip to Sagada is complete without experiencing its caves. 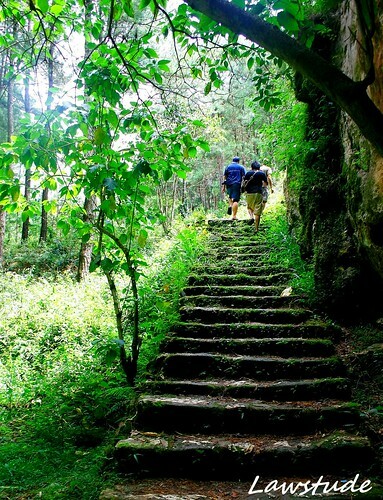 There are at least two caves in Sagada that are offered for exploration to its tourists. The Lumiang Burial Cave and the Sumaging Burial Cave. You can explore each cave or you can do the cave-to-cave connection linking both caves and suitable only to the reasonably fit. Our group decided to explore Sumaging Cave. A guide here is mandatory so the Tourist Information Center in Municipal Hall provided us one. We walked around nine hundred meters on a paved road leading to the cave. Steps made out of stones lead us on the opening of the caves. Muddy and slippery rocks make the initial descent to the cave tricky. Bringing my dslr camera with me made it doubly hard because I have to protect the equipment from the rocks and the water. The best part of the cave was when we reached the smooth limestones and the calcium formations. When I first saw them, I though "Oh Boy, How can I manage to go there, I would definitely slip all over...". But once we set foot on these formations, we were surprised that these are not slippery and have remarkable grip on our bare feet. The whole exploration lasted for less than three hours. Caving in Sagada is such a worthy experience. Difficult but well-worth it. Hopefully, on my next visit, I could do the cave-to-cave connection. Just one advise: leave the dslr and bring a water-proof point and shoot camera. You can check more information about the place at Visit Sagada. hmm..im still not sure i want to go caving. hehe. Not something I would do, but wonderful to see the photos! Whoa, I imagine having to climb those slippery steps! Malumot pa! The color of the water in that cave reminds me of the mess Ondoy left lol! As usual, all your photos are delightful to look at. Thank you for showcasing the beauty of the Philippines! The water cool or not in the cave? The limestone is amazing! How I wish I can go there also. uhmmm... caves? medyo alangan akong pumasok sa mga ganyan. para kasing nasu-suffocate ako. I really love the first image. Love reading about your trip though. Did your province get hit by flood too? very nice and brave. i wanna go there. there is something about caves that are mysterious. i just don't know if i can survive the holes in there. i am afraid to get stucked lol. A nice serie..Beautiful framing and tones..bravo! Oh, this reminds me of a previous visit. Did you notice the fossilized seashells in the cave wall? your shirt lawstude, it blends with the color of the limestone, muntik ka nang di makita. lol. Another great set of pics. I just don't know if I have the guts to go inside the cave. Caving is one thing I enjoy when I was younger. I bet you guys had great time. LS: What a neat place, you did a great job of describing the cave system, That did look like a slippery slope on which you were walking. thanks fo the interesting trip with you and your friends. Your pictures are always of high quality featuring a lot of beautiful places and I do like this! teka, tumulong ka sa barops this year? I imagine it was hard labor to negotiate the caves :) The pictures are beautiful though. It's definitely worth it. Waters in the cave and its navigable by walking? Quite dangerous don't you think? Great photos by the way. Dati, matapang ako sa mga ganyan. Kaya lang, ngayong natutunan ko ng uminom ng kape (ngayong 2009 lang), natatakot na akong pumasok sa mga ganyang lugar. Tapos, paparating na ang The Descent 2.Bwarharhar! After spelunking here, I can now proudly say - I survived Sagada!